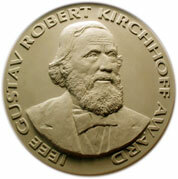 The IEEE Gustav Robert Kirchhoff Award was established in 2003. This award is named for Gustav Robert Kirchhoff, a physicist who made important contributions to the theory of circuits using topology and to elasticity. Kirchhoff's laws allow calculation of currents, voltages, and resistances of electrical circuits extending the work of Ohm. His work on black body radiation was fundamental in the development of quantum theory. This page was last edited on 22 April 2019, at 16:39.